How to use your web-based brand guideline to grow your brand & company. As a brand guidelines company, we know a thing or two about how digital guidelines can fuel brand growth. To help you get the most out of yours, we’ve compiled a list of tips on how to use your guideline to grow a brand and scale your company. Did you know research shows that creating successful brands comes from keeping your visual communication consistent? In most visual cases, that consistency comes from the right people having frictionless access to the same brand materials and guides. This is a list of insights picked up from looking at successful brands & guidelines made by designers in Brandpad, helping their clients and companies use them to their advantage. The get the full value of a (online) guideline, it has to be accessible to everyone that works with your brand. If the right people don’t have access, the right results can’t be reached. Traditionally, this has been designers, marketers, the sales team, suppliers, and partners etc—but now, almost everyone involved in your organization represents your brand somehow—and they should ideally have access to your guideline. To make this as easy as possible in Brandpad, we made it so you don’t have to invite new users to “yet another system”. You can just publish your guideline and distribute the link to all the people you find relevant (internally and externally) and be sure that everyone has access to the same guides & assets all the time. All in all, this helps in keeping your visual language consistent across all channels and makes it easier for the brand to scale with you. Include values & company directions. 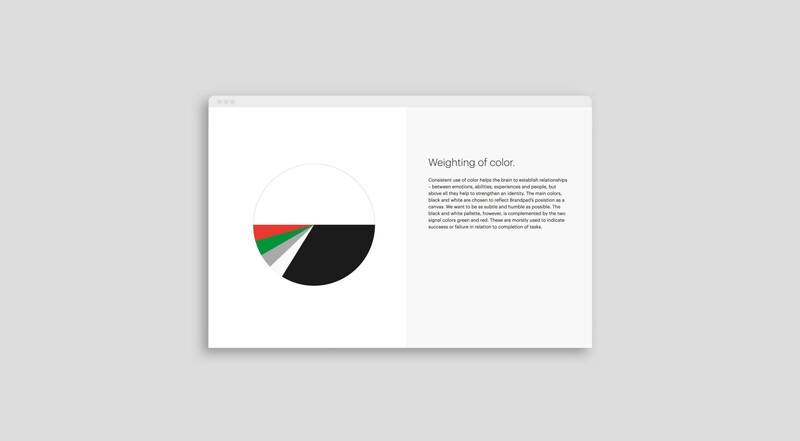 Brand guidelines don’t just have to be about just visuals. The best brand identities are anchored in the companies core values, and those values help provide context and understanding around how to represent the brand through all sorts of communication (i.e., customer support). Try to include tone-of-voice, visions, guiding principals and other ‘soft’ directions in your guideline, and it will be easier for everyone to see the big picture and help pull your brand and company towards the same goal. If the guideline is not kept up to date, accidents will happen. One of the benefits of creating a “single source of truth” for your brand identity is to minimize wrongful usage (and costs connected to this — i.e. this story). Since updates are quick and re-distribution is unnecessary with a digital guideline, updates should be often and the guideline should be used as the delivery system for every change or new material made. This way, everyone has access to the same content at the same time and the odds of mistakes and “back-stepping” is minimal. We see that design studios working on brands with some sort of continuous process (like a monthly retainer) is most successful in this as it gives them the freedom to be proactive in building and growing the identity. Since most people are used to the hassle of trying to find that old PDF with the brand guidelines — it sometimes takes a second for people to get used to how accessible your digital guideline suddenly is. Just like recipes are for chefs, the brand book should be a well-known resource if someone is working with communication (no matter if it’s design, marketing, sales, production, etc). Notifying people of updates is an excellent way to make sure people remember to use it as the basis of their work-and including a “date of last change” in the actual guideline makes it easy for people to see if something has happened since last time quickly. Make the guideline a hub. The best examples of guidelines are the ones who create a full-service solution to the workflow people have when working on brand-related tasks. What else fits into this work process? In some cases, creating links to other resources like important systems (i.e. CRMs or design tools), roadmaps or marketing plans, can help people both get to speed on how to proceed with their work quickly. For others, it’s more about having access to all kinds of files, be it images, templates, reports or similar. Try to make it a ‘one-stop-shop’ for people internally and externally. If you have certain elements that are sensitive and should only be accessed by certain people, we suggest using an extra security layer for this (like the the password-protected buttons in Brandpad). Share it with your target audience. We encourage companies to share the open design philosophy and include their audiences in their brands. Research shows that sharing concepts and brand values have been a successful way to build strong relationships and “fanbase” customers, especially for design-driven companies. Sharing the guideline on social media or in ones community has proven to be a great way to get positive attention for some of the companies using Brandpad (one agency & company client even used this to co-create the identity together with the target audience. More on that later). As a digital guideline is easier to distribute, access and update, you should use that to your advantage towards streamlining and scaling your processes. A successful brand is no longer a recognized logo. It’s a whole universe that people can relate too, and that starts with your own company. Good luck! Brandpad is a brand guidelines system made for designers and companies that are passionate about brand identities, and how they grow. If a tailor-made, digital brand guideline sounds like something for you, you can read more about us at www.brandpad.io.